68 years after World War II, there are more than 110 monuments/museums in the Netherlands, that commemorate America’s role in the liberation of the Netherlands. In cooperation with TracesofWar.com, an initiative of STIWOT, Stichting Informatie Tweede Wereldoorlog, the U.S. Embassy has compiled a list of WWII monuments – some small, some large – dedicated to the American liberators of the Netherlands. If you have any suggestions/additions for this list, please contact the Information Resource Center at the U.S. Embassy in The Hague, ircthehague@state.gov. More than 400 years of U.S. -Dutch relations have left their marks in the Netherlands. 158 sites – some small, some impressive – can be found in all of the 12 Dutch provinces. The Holland Society was founded in New York City in 1885 to collect information respecting the settlement and history of New Netherland. Its main objective is to find and preserve documentation about the inhabitants’ lives and times so as to elucidate the political, social, and religious patterns in the Dutch colony. The museum operates the Half Moon, a reproduction of the ship that Henry Hudson sailed from the Netherlands to the New World in 1609. Its primary objective is to complete the transcription, translation, and publication of all Dutch documents in New York repositories relating to the seventeenth – century colony of New Netherland. Every year there are two events where the Dutch-American Community in the Netherlands celebrate the bilateral relations between the Netherlands and the United States. Around April 19 is the Dutch-American Friendship Day, that remembers the day that John Adams, the second president of the United States, was received by the States General in the Hague and recognized as Minister Plenipotentiary of the United States of America. It was also the day that the house he had purchased at Fluwelen Burgwal 18 in The Hague was to become the first American Embassy in the World. The second day of commemoration is the Dutch-American Heritage Day which is on November 16. Following is the official proclamation of President Bush, declaring November 16 1991 as Dutch-American heritage Day. Since that time November 16 has been celebrated by the US-Dutch community. On November 16, 1776, a small American warship, the ANDREW DORIA, sailed into the harbor of the tiny Dutch island of St. Eustatius in the West Indies. Only 4 months before, the United States had declared its independence from Great Britain. The American crew was delighted when the governor of the island, Johannes de Graaf, ordered that his fort’s cannons be fired in a friendly salute. The first ever given by a foreign power to the flag of the United States, it was a risky and courageous act. Indeed, angered by Dutch trading and contraband with the rebellious colonies, the British seized the island a few years later. De Graaf’s welcoming salute was also a sign of respect, and today it continues to symbolize the deep ties of friendship that exist between the United States and the Netherlands. After more than 200 years, the bonds between the United States and the Netherlands remain strong. Our diplomatic ties, in fact, constitute one of the longest unbroken diplomatic relationships with any foreign country. Fifty years ago, during the Second World War, Dutch and American Servicemen fought side by side to defend the universal cause of freedom and democracy. As NATO allies, we have continued to stand together to keep the transatlantic partnership strong, and to maintain the peace and security if Europe. In the Persian Gulf, we joined as coalition partners to repel aggression and to uphold the rule of law. While the ties between the United States and the Netherlands have been tested by time and by the crucible of armed conflict, the Dutch-American heritage is even older than our official relationship. Indeed, it dates back to the early 17th century, when the Dutch West India Company founded New Netherlands and its main settlement, New Amsterdam and Fort Orange – better known today as New York City and Albany. From the earliest days of our republic, men and women of Dutch ancestry have made important contributions to American History and culture. The influence of our Dutch ancestors can stilll be seen not only in New York’s Hudson River Valley but also in Pennsylvania along the Schuylkill River and in communities like Holland, Michigan where many people trace their roots to settlers from the Netherlands. Generations of Dutch immigrants have enriched the United States with the unique customs and tradions of their ancestral homeland – a country that has given the world great artists, celebrated philosophers, and leaders of international business. On this occasion, we also remember many celebrated American leaders of Dutch descent. Three presidents, Martin Van Buren, Theodore Roosevelt, and Franklin D. Rooselvelt, came from Dutch stock. Arthur Vandenberg, who after World War II played a crucial role in the development of our bipartisan foreign policy, the strategy of containment, and the establishment of NATO, also traced his roots to the Netherlands. Our Dutch heritage is seen not only in our people but also in our experience as a Nation. Our traditions of religious freedom and tolerance, for example, have spiritual and legal roots among such settlers as the English Pilgrims and the French Huguenots, who first found refuge from persecution in Holland. The Dutch Republic was also among those systems of government that inspired our Nation’s founders as they shaped our Constitution. 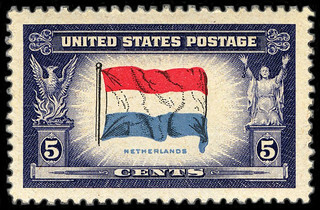 In celebration of the long-standing friendship that exists between the United States and the Netherlands, and in recognition of the many contributions that Dutch-Americans have made to our country, the Congress, by House Joint Resolution 177, has designated November 16, 1991, as “Dutch-American Heritage Day” and has authorized and requested the President to issue a proclamation in observance of this day. NOW THEREFORE I, GEORGE BUSH, President of the United States of America, do hereby proclaim November 16, 1991, as Dutch American Heritage Day. I encourage all Americans to observe this day with appropriate ceremonies and activities. IN WITNESS WHEREOF, I have hereunto set my hand this fourteenth day of November, in the year of our Lord nineteen hundred and ninety-one, and of the independence of the United States of America the two hundred and sixteenth.